One of the most often requested Google searches relates to finding the ideal spreadsheet template that digital marketers can use to analyze social media. The problem with many of these searches is that many of you might not have a lot of confidence that the KPIs you’re currently tracking are the same ones that many industry veterans now consider to be best practices. In this article, we’ll provide you with a few key resources to help you build and analyze your social media content which include some of the most popular spreadsheet templates to help you analyze you social media. It’s time to optimize your digital marketing scheme and reach those benchmarks your CEO is looking for! As mentioned in a recent Harvard Business Review article, 25% of content about a brand or company is voiced by consumers on social media networks. So, first and foremost, it’s important to understand where your brand sits in the social-media-sphere. HBR’s social media audit template is a great place to start (the image below is an example already filled in), and you can easily enter the categories into a spreadsheet to keep your findings handy. By conducting an audit, you will gain an understanding of what your consumers are saying about your brand and potentially find insights to spark upcoming campaign concepts. After analyzing what’s being said (or not said) about your company across the different social communities, you can begin to devise a strategy. There are many ways to go about this (and also get lost going about this) so Hubspot created a guide that helps lay out and organize what needs to be done for your brand on social media and how to go about it. It might not exactly be a spreadsheet, but you need this tool! Now that you’ve devised the types of messages you want to send to your audience, you can create an editorial content calendar (hint: 90% of marketers are using content calendars according to Curata research). Calendars allow you to organize details and topics that you’d like to incorporate in your posts so you can craft and curate the best content. 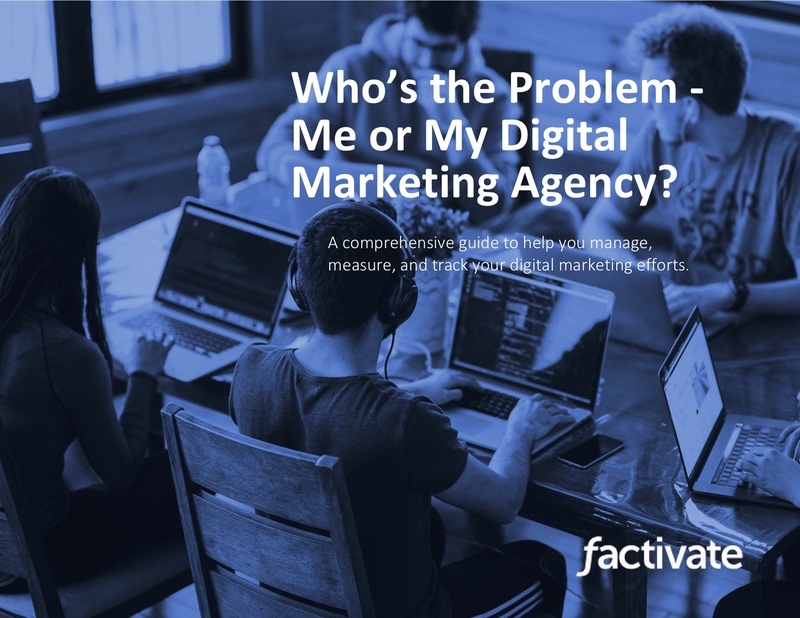 At Factivate, we create content agendas for all our social media sites, but pay special attention to what we push out on Facebook because that’s where we are currently seeing the most activity. Want to track your Facebook analytics and create a custom calendar? See what we use at Factivate. In a report published by the Social Media Examiner, 88% of marketers want to learn more about measuring the success of their social media efforts and 87% don’t know what tools are best to do so. But don’t worry, we’re here to help. Now that you’re rolling with content–well-thought out, organized and effective thanks to your spreadsheet calendar–you can get to analyzing how your posts are performing. Are you taking strides toward your social goals? Are you gaining desired traction? It’s time to look at what is working and what is not so you can get that ROI. 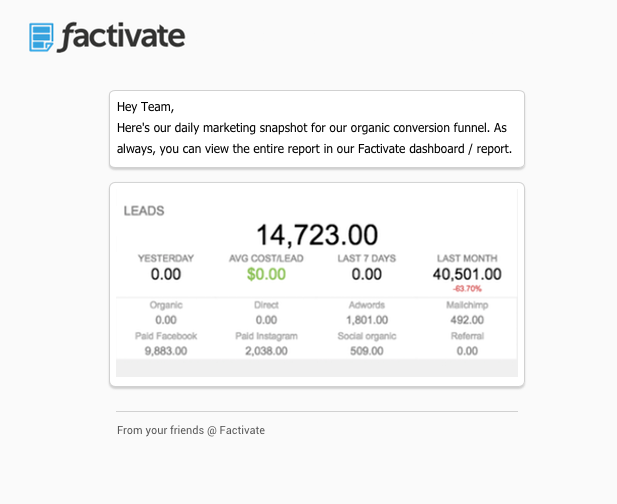 At Factivate, we start by considering the three main social media key performance indicators (KPIs): conversation rate, applause rate, and amplification rate (learn more about them here). These metrics essentially tell you in different ways whether the messages you’re sending are being accepted by your target audience. If we notice a significant increase in any of the rates, we then look a little closer into the metrics from individual posts to figure out why they did so well and what actions were taken by consumers as a result. There are plenty more KPIs to look at when analyzing your data, but make sure that you focus primarily those that express some sort of behavior. Did they interact with the post? Did they go to the landing page or follow the desired call-to-action? As digital marketing expert Jay Baer puts it best, “The end goal is action, not eyeballs.” Below we’ve included a couple screen shots to give you an idea of what our spreadsheets look like. So there you have it. Some of the best ways to start analyzing your social media. Interested in finding spreadsheets to analyze more? We have a full line up of all the spreadsheets you’ll ever need to measure your marketing metrics and KPIs. Seriously, we make reporting these numbers a breeze. Check out our template marketplace here! Do you have any additional KPIs you like to track? Let us know in the comments section below!